Institutional Review Blog: Why not make IRB review voluntary? Why not make IRB review voluntary? One of the best arguments I have read in favor of IRB review of interview and survey research is Joan E. Sieber, "Privacy and Confidentiality: As Related to Human Research in Social and Behavioral Science," in National Bioethics Advisory Commission, Ethical and Policy Issues in Research Involving Human Participants, volume II (The Commission, 2001). Sieber, a psychologist who has studied the ethics of research since the early 1980s, provides some compelling examples of cases in which a researcher might have trouble deciding what levels of confidentiality are appropriate and how to achieve them. For example, she lists the complex networks of laws that might require the disclosure of research data. And she points out the technical difficulties of knowing what data--age, job title, and the like--might be harmless in one case but sufficient to identify individuals in others. While I do not agree with all of her judgments, were I planning research in some of the sensitive areas she describes, I would want to have her advice or that of someone like her. The regulations of human research, as currently written, give little hint of how finely the protocol and informed consent relationship must be crafted in response to the manifold aspects of privacy and confidentiality in social research. Worse, they do not allude to the background of concepts and plans that would underlie such an effective protocol and relationship. Remarkably, some IRBs function quite effectively despite these ambiguities, through wise interpretation by IRB members who are well schooled in ethical problem solving and whose scientific training has provided relevant research competencies. Such a fortunate confluence of education, competency, and effort is not the norm, however. Nor can such outstanding performance reasonably be expected of most IRBs, which are woefully overworked and under-budgeted. There is now a literature of virtually hundreds of approaches to protecting privacy or assuring confidentiality. This literature is rarely sought out by IRBs, researchers, or teachers of research methods. Most are not even aware that it exists. . . . Many IRBs have little sense of the range of privacy issues they should consider or of the range of solutions that might be employed in the service of valid and ethical research. Many IRB chairs, members, and staff persons are not in a position to effectively guide or teach their clientele, or to gain the respect of their clientele. In other words, many IRBs know less about research ethics than the researchers themselves, and are likely to do more harm than good when they intervene. Sieber proposes to remedy this problem with a "web-based educational resource . . . that will guide the ethical problem solving in research. Itshould not be offered as an official regulation, or interpretation of regulations, but as a user-friendly educational resource that will challenge IRBs, researchers, teachers, and students to improve their ability to craft solutions to ethical and methodological problems." Instead of judging protocols by guesswork, IRBs could apply scholarly standards, backing up their recommendations with citations to empirical research. 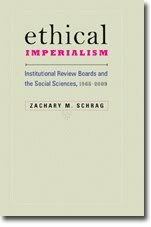 In this vein, Sieber now edits a new journal, the Journal of Empirical Research on Human Research Ethics, which presumably seeks to provide the kind of knowledge she identified as crucial in 2001. Unfortunately, Sieber fails to address the institutional barriers to her recommendations. As Carpenter and Hyman note, IRBs have little incentive to base their decisions on scholarly ethics, rather than regulations. If the federal government audits them, it will judge them on their compliance with procedures, not the soundness of their advice. And since the researchers at their institutions form a captive audience, they have no real reason to "gain the respect of their clientele," as Sieber puts it. If Sieber really believes in the power of IRBs to educate researchers, she should advocate voluntary review. Good librarians do not need federal requirements to attract researchers; they need sticks to keep the researchers away. The same is true of other university offices that offer research assistance, such as writing centers and statistical or computer training departments. Why not make IRB review voluntary? Skilled IRBs would lose nothing, since serious researchers would continue to seek their advice. Unskilled IRBs, in contrast, would have to shape up by educating themselves in the ways Sieber recommends. And neither researchers nor their subjects would lose anything as researchers quit consulting incompetent boards. The system would not be perfect, but it would impose a quality control now lacking. "Sieber concedes, however, that many or most IRBs are unable to provide such guidance"
That doesn't keep them from trying, given that they have adopted a mandate to "find a problem," not "is there extraordinary risk"
The point re seeking out librarians is quite good, I have always thought researchers to be more aware of their limits than ethicists.